We are sad to report that the below mentioned event has been cancelled due to the warm weather. Make sure you join us in 2018!!!! Due to the warm weather that we are experiencing here in Wisconsin, this event has been rescheduled to Feb 25th. Smoking Joe Prussiano, three time Pikes Peak Champion, as well as, Cory West, the man that holds the lap record at Daytona are scheduled to race. Saturday, Feb 25th is your chance to see just how fast you are against these legends! 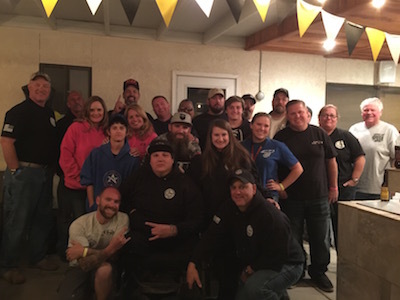 These instructors, from the Colin Edwards Texas Tornado Boot Camp, will be racing to help benefit Race For The Wounded (RFTW), a 501 c3 that is run by combat veterans and is 100% volunteer. 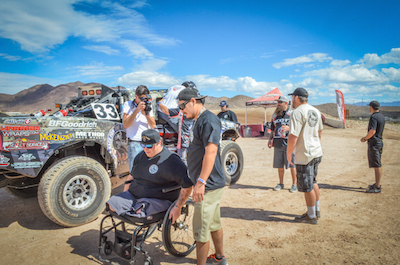 Every dollar is used to help our wounded veterans get back into or start racing. Craig Hall and Ryan Morris are living the dream of racing thanks to supporters like you! 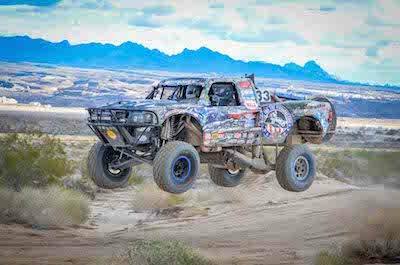 Both of the veterans have attended the Texas Tornado Bootcamp www.texastornadobootcamp.com , and RFTW sent Craig to the Mexican 1000 where he took a 1st in class and 7th overall in this 1221 mile race. Ryan went on to win a championship road race in Texas. Come join us and help support RFTW! 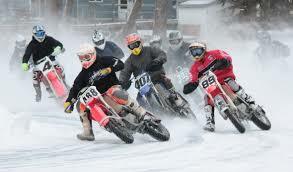 The event will be held at Stinkers Bay – North Shore Lake Koshkonong, WI / Sunset Bar & Grill W7905 High Ridge Road Fort Atkinson, WI 53538. www.sunsetbaronthelake.com There will be two 2-hour endurance races for AMA & Canadian studs with a 4 rider per team maximum. All proceeds go to RFTW. There will also be a special appearance by Ryan Suchanek and Cecil Bubba Meyers who will be attempting to set some new world wheelie on ice records! You don’t want to miss this event!! Families and spectators are welcome!!! Spread the word! 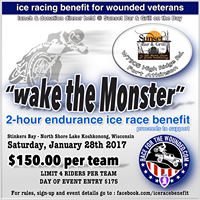 Please come on out and meet some of America’s best racers and see how they help support and mentor our wounded veterans. See YOU on the ice!